This month you can win your way to the Madrid Live Deep Stack Poker Festival, where there will be a prize pool of $400,000, by playing in satellite qualifiers at Intertops Poker. 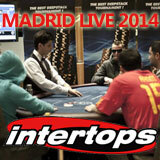 Two players at Intertops' “Madrid Live Final” April 6th will win a chance to play in the live tournament in Spain. The two $2000 prize packages include the €770 buy-in for the event at the Casino Gran Madrid April 24 – 27. You can buy-in to play in the Intertops’ Madrid Live Final is $50+$5 but between now and then you can win a seat at that final event at weekend satellites. Now in its third season, this year the Madrid Live Deep Stack Poker Festival, produced by Mega Poker Series, offers its largest prize pool ever. The game is No-Limit Texas Hold’em Freezeout. German player Adrian Apmann won the event last year.